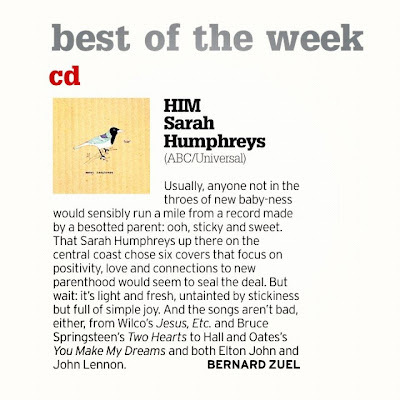 Hey Jude: A review of 'Him' by Bernard Zuel of the Sydney Morning Herald. No big deal. A review of 'Him' by Bernard Zuel of the Sydney Morning Herald. No big deal. Can anyone say 'yew!!' like a bogan? Oh you betcha. Seriously though, i'm really chuffed. Tears in eyes chuffed. Congrats - hope you had a glass of champers to celebrate, I would have! That's fabulous Sarah. Fabulous. So pleased for you. Where can I get this CD?